Against a recent World Wildlife Fund report, claiming that by 2020 almost two thirds of animal species in the world will be extinct, Turning Animal raises a number of urgent critical questions concerning the timeless problem of categorizing the human in opposition to the animal. 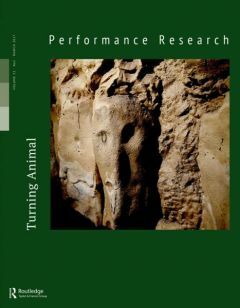 Drawing on a recent turn within the posthumanities that problematizes the humanist distinction of the animal as ‘other’, this issue considers how performance studies has embraced the possibilities of ‘animal becoming’, in a conceptual sense as well as the act of ‘turning animal’ in a more material and performative sense. 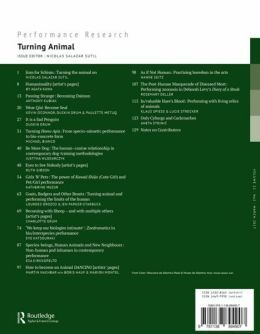 With contributions coming from a variety of critical perspectives, as well as a wide array of geographic and species-specific contexts, this issue urges us to consider how, in the face of a ‘sixth mass extinction’, our condition as human earthling is ecologically bound to earthly life of all shapes and sizes.